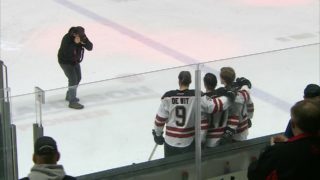 CALGARY — As Red Deer Rebels broadcaster Cam Moon stated in the dying seconds of a 1-0 win over the Calgary Hitmen, it was only fitting that former Rebels netminder Cam Ward was in the Saddledome Saturday. The Chicago Blackhawks goalie, in town for an evening matchup versus the Calgary Flames, greeted the Rebels prior to the contest and just hours later Ethan Anders finished with a 34-save-shutout. In many ways, Anders’ performance — witnessed by 5,613 fans — was reminiscent of what Ward delivered on a regular basis for the Rebels in the early 2000s. Anders was here, there and everywhere in the third period, stopping all 16 shots thrown his way while his teammates mustered just one at Hitmen goaltender Jack McNaughton. 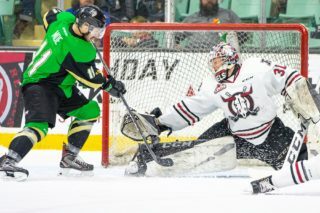 Most of the final frame was played in the Red Deer zone and Anders had to come up large on several occasions as the visitors were assessed three consecutive penalties. 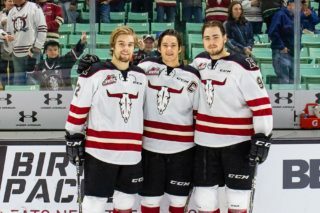 The second-year Western Hockey League goalie made sensational blocker and stretch saves on James Malm and Jake Kryski during a Calgary power play, and then took goals away from Malm and Mark Kastelic on a later man advantage situation for the Hitmen. “We took some penalties in the third period and they applied a lot of pressure, but Andy was very good. 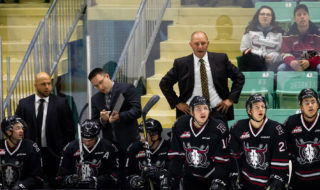 He was our best penalty killer,” said Rebels GM/head coach Brent Sutter. That lead was provided by Jeff de Wit, whose 10th goal of the season — a power play tally — at 17:34 of the opening frame was all the offence the Rebels needed. On the decisive marker, Dawson Barteaux wired a wrist shot from the point that de Wit, while going hard to the net, redirected past McNaughton. “We were good for a lot of the first period and the second was our best period,” said Sutter, whose club was outshot 12-8 in the first 20 minutes and then held an 8-6 margin in the second stanza while presenting their hosts with very little in the way of scoring chances. The contest was just the Rebels’ second in seven days. “With a big break like we’ve had in our schedule you get to practise a lot but it’s not the same as playing a game,” said Sutter. Notable: Predictably, Anders was named first star of the game. McNaughton, who was particularly sharp in the middle period, stopped 16 shots and was selected as the second star, while de Wit earned third-star status . . . Defenceman Alex Alexeyev drew an assist on de Wit’s goal, extending his points streak to seven games in the process . . . 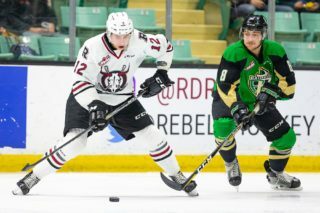 The Rebels are now idle for nearly another week, their schedule taking them on the road for games next Friday, Saturday and Sunday in Brandon, Moose Jaw and Swift Current.